The song which was to become the Irish National Anthem was written one hundred years ago in 1907 by Peadar Kearney, Dublin republican, IRB Supreme Council member, Irish Volunteer, political prisoner and author of many songs and poems. The story of The Soldier’s Song/Amhrán na bhFiann is inseparable from the life story of Kearney, which is typical of so many who took part in the struggle for freedom at the start of the 20th century. 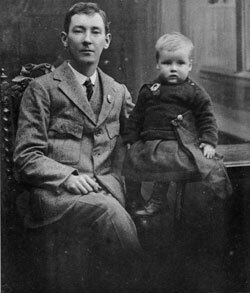 Peadar Kearney was born at 11 Lower Drumcondra Road (now 68 Lower Dorset Street), Dublin on 12 December 1883. A plaque now marks his birthplace. His father was from County Louth and his mother from County Meath. He was educated at St Joseph’s Christian Brothers School in Marino and left school at the age of 13. He became an apprentice house painter. Through Barlow, Peadar secured work with the National Theatre Society and they were the first to inspect the derelict Mechanics Institute Theatre in 1904 before it was taken over to become the Abbey Theatre. Peadar worked on and off for the theatre until 1916, assisting with the scenes and occasionally doing walk-on parts. He was one of seven members of the Abbey Company who took part in the Rising, including Captain Seán Connolly of the Citizen Army, who was killed at City Hall on Easter Monday. Peadar’s main collaborator in music was his friend and comrade Paddy Heeney, another Northside Dubliner, who put music to Peadar’s words after they started their musical partnership in 1903. Heeney picked out the tunes on his melodeon and then they were noted down. Some time in 1907, Peadar decided to write a song with a rousing chorus and an unusual metre. The result was The Soldier’s Song. He gave the words to Heeney to put music to them. At first Heeney had trouble with the song and gave up his effort at one point. He persisted and the finished product was first sung by PJ Bourke at 10 Lower Dominick Street to an audience of two – Peadar Kearney and Seán Barlow. It is said that at first The Soldier’s Song did not prove popular but eventually so many people asked Peadar for the words that he approached Bulmer Hobson, editor of the IRB newspaper Irish Freedom, to publish them. Thus, the song first appeared in print in 1912. The now largely forgotten composer of the music to the National Anthem, Paddy Heeney, had died aged only 29 and in poverty in Jervis Street Hospital in June 1911. He was buried in an unmarked grave in Drumcondra Cemetery, where a plaque on the wall now commemorates him. Peadar, then in London with the Abbey Company, took up a collection for his deceased friend’s mother. Among the contributors were two fellow IRB men based in London – Michael Collins and Sam Maguire. Before I pass unto the night – Slán Libh. Peadar joined the Irish Volunteers when they were founded in 1913. He was also an organiser for the IRB, travelling around Leinster on his bicycle. He took part in the Howth and Kilcoole gun runnings in 1914. 1916 found Peadar Kearney again in England, with the Abbey Company, when word came to him that he was needed in Dublin, as plans for the Rising were maturing. He travelled home on a coal boat through a storm. On Easter Monday 1916 he took up his post under Commandant Thomas McDonagh in Jacob’s Biscuit Factory. After the surrender he managed to evade capture and went on the run. Various participants in the Rising have recalled that The Soldier’s Song was one of the most popular songs sung by the Republicans during Easter Week. It had surpassed Thomas Davis’s A Nation Once Again and the ballad of the Manchester Martyrs, God Save Ireland, as a popular song of defiance to British rule. By the time of the Tan War it was the unofficial National Anthem. In1920, at the height of the British terror in Dublin, Peadar was living in Richmond Cottages, Summerhill, with his wife Eva and their two sons. In the early hours of 25 November the house was raided by Auxiliaries and Peadar was arrested. Among those being rounded up was Martin Walton (later proprietor of the well-known music shop in Dublin) who sang The Soldier’s Song in front of the Auxies when he saw Peadar among the detainees. They were interned first at Collinstown Camp (where Dublin Airport now stands) and then at Ballykinlar Camp, County Down. Peadar was released exactly a year after his arrest. As an IRB man and friend of Michael Collins, Peadar Kearney initially took the Free State side during the Civil War but he does not seem to have played an active part. Like many who had been close to Collins, he quickly became disillusioned with the Free State. Meanwhile, The Soldier’s Song had been translated into Irish as Amhrán na bhFiann by Liam Ó Rinn and was first printed in that form in 1923. It was officially adopted as the National Anthem by the Free State government in 1926. Peadar Kearney spoke on Republican platforms in Dublin during the 1930s. Never in great health, he became less active and devoted himself mainly to literary work at his last home in O’Donoghue Street, Inchicore. Although he was the author of the National Anthem and many other popular songs, Peadar gained little financially from his efforts and died in relative poverty. His republicanism and literary work proved to be a key influence on his nephew, Brendan Behan, who always spoke very highly of him. When Peadar died, Brendan was a republican prisoner in Mountjoy and was refused parole to attend the funeral.